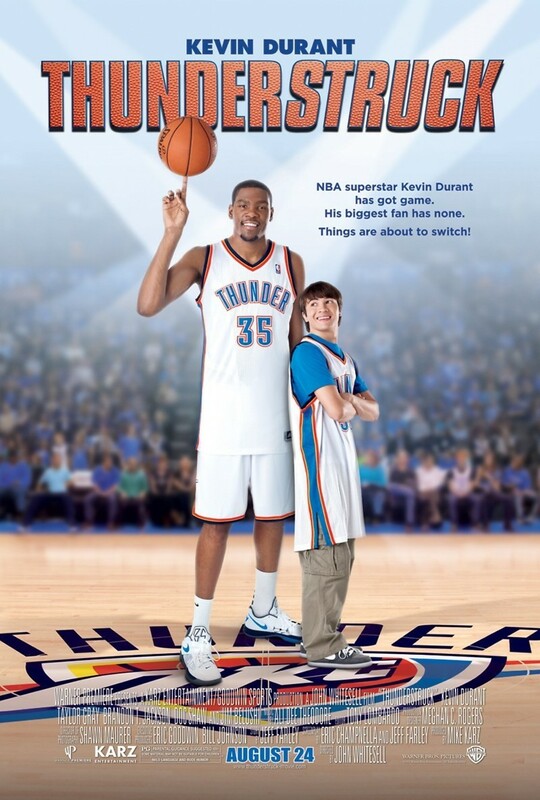 Thunderstruck DVD and Blu-ray release date was set for December 4, 2012. Brian is a teenager living in Oklahoma who is a huge basketball fan. However, he is also uncoordinated and can only manage to make his high school team as the towel boy. His lack of talent draws the ridicule of the team's star player, Connor, and does nothing to impress the pretty new girl in town, Isabelle. While attending an NBA game between the Oklahoma City Thunder and Detroit Pitons, Brian is chosen to take a half-court shot, but only manages to hit the team's mascot. When Thunder star Kevin Durant signs the ball for him after the game, their basketball talents are mysteriously switched. Suddenly Brian becomes an unstoppable force for his high schol team while Durant can't seem to make a shot.